Kneel Before Blog - Shazam! 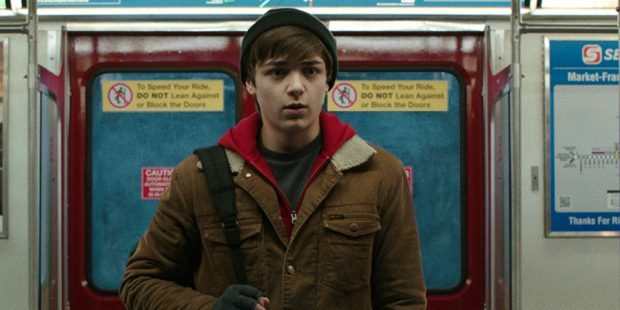 An orphaned teenager gains the ability to become an adult superhero from a dying Wizard in David F. Sandberg’s Shazam! Warner Brothers have been working tirelessly to salvage the DC movie franchise after several critical and financial disappointments. It was clear their grim and joyless approach wasn’t working but steps have been taken to correct that with some lighter entries. Aquaman was a big success and Shazam! is along similar lines. Billy (Asher Angel) is a directionless orphan being bounced around from foster home to foster home as he looks for the mother he lost when he was a child. The introduction to Billy involves him tricking cops so that he can access their database to track down all of the Batson’s in the area. Immediately this sets him up as having unresolved abandonment issues stemming from the confusing circumstances around how he came to be on his own. This forms the basis for his core trait of being unable to trust others and refusing to let himself belong to any family unit. I won’t spoil what happens but his search for his mother is resolved in this film and it plays out in an unexpectedly poignant way that proves to be definitive for Billy as a character. Asher Angel is great as the younger Billy; he’s very charismatic and charming with a great deal of depth to his performance that accentuates his frustrations at the hand life has dealt him. The core of the Billy character is his wilful blindness to the possibility that he is unwanted. He is fixated on finding his mother as he feels that achieving this will be the end of his problems which causes him to ignore genuine attempts to make him feel included in other ways. This role is shared by Zachary Levi who plays the older Billy Batson when he is in his hero guise. Zachary Levi does a great job maintaining the continuity of Billy’s character in this very different body. All of his established traits are still there as well as some extra self confidence that comes with knowing that you’re suddenly practically invulnerable. Levi never loses that immature quality in his performance and has great comic timing that makes him constantly entertaining to watch. Most of Billy’s interactions are with Freddy (Jack Dylan Grazer) who acts as a surrogate brother figure to him. It’s a strong relationship that goes through many ups and downs over the course of the story adding tension and triumph where appropriate. Freddy works as the audience point of view who helps Billy explore what it means to have abilities and often acts as the voice pointing out the typical tropes while the film delivers its own version of them. The really interesting thing about Freddie and the world of the film in general is how real he seems. Instead of being a precocious youth somehow burdened with wisdom beyond his years he does clearly have a lot to learn and doesn’t go about things in the right way. He has a disability that he’s sort of obnoxious about which is certainly something I haven’t seen a lot of in fiction. It all works to make the background details of this film feel more realistic. One of the best things about this film is how it explores the typical superhero origin story. Those familiar with the genre won’t find anything new here but the approach is somewhat unique. 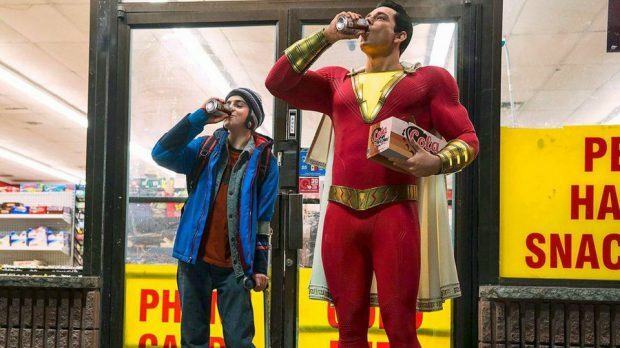 There are some really creative subversions of the typical superhero trappings that help cement this film as being deliberately tongue in cheek while still being taken seriously enough to prevent the film from seeming completely ridiculous. Using the lens of childhood to explore those powers while modernising them appropriately through the use of social media and YouTube to gain instant empty popularity is an inspired choice that fits with the age of the characters. Early on in the film there is no sense of nobility to Billy and his more negative traits are actually amplified by him gaining super powers. He more or less blunders into heroism late in the film meaning that his arc takes a lot longer to begin than you may expect from a film lime this. It also plays around with being set in the DC universe through several references to characters like Batman and Superman. Focusing on the kids allows for a more domestic perspective on those larger than life characters while giving Billy something of an example to build up to. The references never feel intrusive and are really well used in places such as following a checklist based on Superman’s powers . They are very overt as references go but in the best way. Most of the time the various references are played for laughs adding to the general light tone the film has. Of course comedy is a very subjective thing but this film’s approach to humour really resonated with me. The side characters are also fairly engaging even if they sit firmly in the background. Darla (Faithe Herman) is the highlight with her wonderfully delivered adorable one liners that endear her to the audience and continually reinforce her core motivation while establishing how she relates to Billy. The others don’t stand out quite as much but as a group they help to serve Billy’s arc well enough. It’s striking to note that there’s a very working class feel to the whole thing. They are all foster kids living in a chaotic yet functional group home with parental figures who are equal parts supportive and firm authoritative figures. It’s a very clear indication that families can be manufactured by changing circumstances and acceptance. The overall diversity of the group home feels like far more than a simple diversity checklist and adds wonderfully to the texture of the film. Mark Strong’s Dr. Thaddeus Sivana serves as the film’s main villain and there’s not a lot to say about him. There is merit in the simplicity of a villain who is simply a bad person with a lust for power. His motivation for seeking that power is made clear early on and everything he does is in service of that pursuit but he also lacks anything resembling a character and never manages to be interesting. All he amounts to is an oppositional force with the power to endanger Billy and those close to him. There was definite potential to flesh out this character through his familial relationships and inadequacy complex but the film opts to keep this simple instead which is a valid choice but makes him more difficult to invest in as a defined threat. There was also a missed opportunity in him being affiliated with the physical manifestations of the seven deadly sins as they are visually uninteresting. The idea of a group of creatures representing all of the sin on Earth is a really compelling idea especially when connected to a villain who embraces those sins because he is driven unenlightened self interest but the film only explores that on a surface level. In some ways this is a good thing as there is more time to devote to Billy while implying that there’s a weird and wacky magical fantasy world rife for exploration in the sequels but it still feels somewhat limited in the context of this particular story. An strong and delightfully self aware superhero origin story that has a lot of fun with the usual trappings that come with the setup and focuses the narrative on engaging characters. Billy is a really compelling character with lots of flaws that seem to be amplified once he gains super powers. It takes a long time for his journey towards heroism to kick in and when it does he largely blunders into it. This is refreshing and allows the film to play around with the origin story tropes in creative and hilarious ways. The supporting characters are also really engaging even if some of them are fairly limited in their portrayal. Their diversity feels organic and adds to the texture of the background while developing the them of the wonderful complexity of family. Sadly the film stumbles somewhat in its villain even if the simplicity of his motivation has merit. With a little more work the villain could have been a much stronger part of the narrative but as it sits he comes across as something of an afterthought which does leave more time for Billy while hinting that there’s a larger fantasy world rife for exploration but it does still feel limited.